Playing for the Bears, Ed Sprinkle appeared in four Pro Bowls and was named to the N.F.L’s all-decade team for the 1940s. Credit Big Country Athletic Hall of Fame. Ed Sprinkle, who gained a reputation as “the meanest man in football” while playing for the Chicago Bears, leveling quarterbacks with ferocity in becoming a rugged prototype for pro football’s pass-rushing defensive ends, died on Monday in Palos Heights, Ill. He was 90. His daughter, Susan Withers, confirmed the death. Even by the N.F.L.’s roughhouse standards of his era — the 1940s and ’50s, when players like Chuck Bednarik and Bucko Kilroy of the Philadelphia Eagles and Hardy Brown of the San Francisco 49ers were notorious tough guys — Sprinkle stood out. He weighed only 200 pounds or so, but in his 12 seasons with the Bears, he flattened quarterbacks with a powerful forearm delivered to the nose, jaw or throat, a legal tactic at the time that earned him the nickname the Claw. “I never really played dirty football in my life, but I’d knock the hell out of a guy if I got the chance,” Sprinkle told Stuart Leuthner in the oral history “Iron Men” (1988). 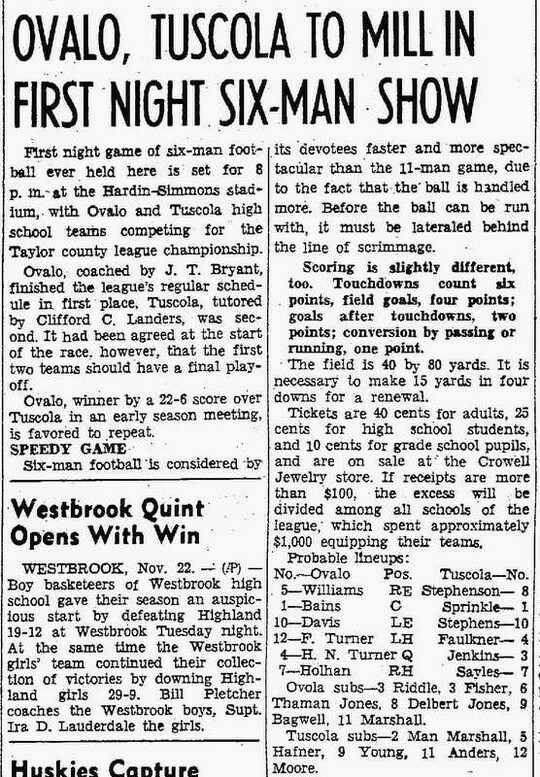 Playing for the Bears from 1944 to 1955, Sprinkle menaced quarterbacks at a time when the T-formation and its passing game replaced the single wing. He also played havoc with running backs and pass receivers. “Sprinkle would drive you 10 yards out of bounds and the official would be taking the ball away from you, but Sprinkle would still be choking you,” Hugh McElhenny, a Hall of Fame halfback for the 49ers, told The New York Times in 1985. 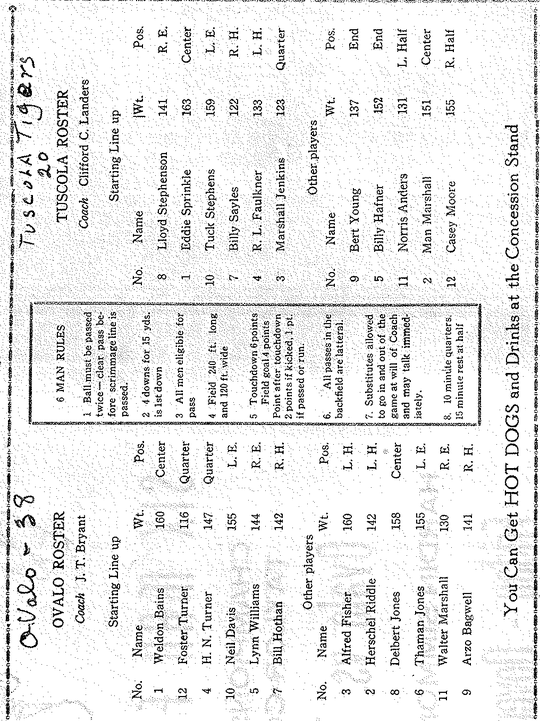 In the 1946 N.F.L. championship game, Sprinkle forced two Giants running backs to the sideline, George Franck with a shoulder separation and Frank Reagan with a broken nose. He also broke the nose of Giants quarterback Frank Filchock with his claw move, an illegal clothesline tackle in today’s game. As Filchock was being battered by Sprinkle, he managed to get a throw off, but it was intercepted and run back for a touchdown in the Bears’ 24-14 victory. Sprinkle, who went about his business without a face mask, wielded various tactics in addition to his signature move. He described them to Bill Fay in a November 1950 Collier’s magazine profile that defined his legacy with a headline that called him football’s “meanest.” “There were all sorts of things you could do to keep a guy from catching a pass,” Sprinkle explained. First, there was tripping: “You just put your foot out and let the other guy fall on it.” Second, was chucking: “You put your hands out as though you’re pushing, but actually you’re grabbing your opponent’s shirt and you hold him for a one-two count.” Third, was spinning: “You grab a guy’s shirt as he’s running by and yank. If you’ve got a strong grip and your timing is right, he’ll spin himself right out of the play. Sprinkle sometimes got as good as he gave. Edward Alexander Sprinkle, a son of sharecroppers, was born on Sept. 3, 1923, in the West Texas town of Bradshaw and grew up nearby in Tuscola, Tex., south of Abilene. He played for Hardin-Simmons University in Abilene and for the United States Naval Academy. He tried out for the Bears at the urging of Bulldog Turner, Chicago’s center-linebacker and future Hall of Famer, who had played for Hardin-Simmons and tutored him there as a part-time adviser to the team. Sprinkle was often a guard and then an offensive end in his early pro seasons, catching seven touchdown passes, and he sometimes played on both offense and defense before concentrating on the right defensive end position. He had various business interests after retiring, but returned to pro football for a single season as the defensive coordinator for the 1962 Titans of the American Football League, the forerunners of the Jets, when Turner was their head coach. In addition to his daughter, Sprinkle is survived by his sons Alan and Steven, five grandchildren and five great-grandchildren. His wife, Marian, died in 2003. The Collier’s article on Sprinkle noted that he was a decent sort in the off-season, when he worked for Inland Steel, ran a strawberry farm and was devoted to his family. Halas defended Sprinkle’s ferocious play. A version of this article appears in print on August 1, 2014, on page A17 of the New York Times edition with the headline: Ed Sprinkle, 90, Defensive End Known for Violent Play. 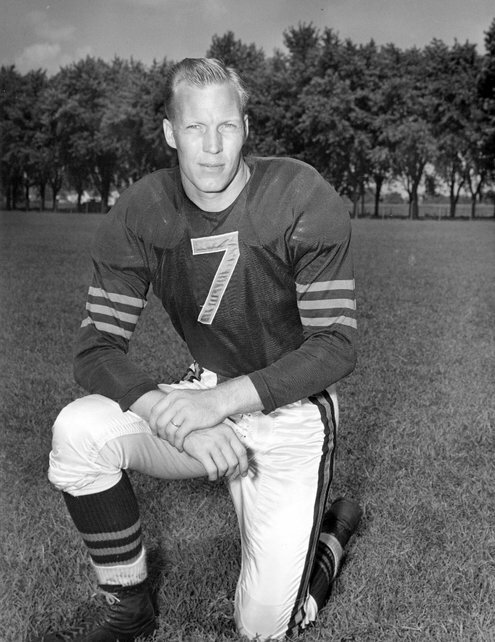 Former Bear Ed Sprinkle, 1923-2014, was standout defensive player. They called him 'The Claw.' 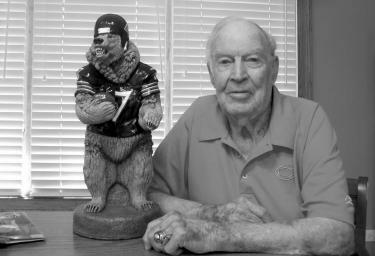 Former Bear Ed Sprinkle dead at age 90. Ed Sprinkle, a standout defensive end for the Chicago Bears in the 1940s and 1950s, was nicknamed "The Claw" and known for his rough style of play, once acknowledging in a book about the team's rivalry with the Green Bay Packers that "if you got a chance to kill a guy, you killed 'im." Mr. Sprinkle — diminutive by today's standards at 6-foot-1-inch and a little more than 200 pounds — was labeled the meanest man in football in a 1950 Collier's magazine article. "Ed was one of the toughest defensive ends I've ever seen in football. He was fierce," said former Bear Ralph Jecha, who played alongside Mr. Sprinkle in 1955. "He wasn't that big, but if you came around the end, he got you around the throat, and you suffered. You really suffered." Mr. Sprinkle, 90, died of natural causes Monday, July 28, said his daughter, Susan Withers. He was a resident of Palos Heights and previously lived in Palos Park, she said. Born Edward Alexander Sprinkle in Bradshaw, Texas, Mr. Sprinkle grew up in Tuscola, Texas. He played football and basketball at Hardin-Simmons University in nearby Abilene, then transferred to the U.S. Naval Academy, where he also played football. Encouraged by a fellow Hardin-Simmons alum, Bears player Clyde "Bulldog" Turner, Mr. Sprinkle tried out for the Bears in 1944. He made the team and early on played as a blocker on offense before shifting exclusively to defense. Nicknamed "The Claw" for the use of his forearms against opponents, Mr. Sprinkle employed his tactics frequently against the Packers, whom the Bears played twice each season. Mr. Sprinkle always contended his style of play was rough but legal. His techniques, according to the Collier's article, included tripping and spinning his opponents. "As far as anybody from the Bears or Green Bay trying to hurt somebody or play dirty, it wasn't in the cards as far as I'm concerned," Mr. Sprinkle told the authors of the 1997 book on the Bears-Packers rivalry, "Mudbaths and Bloodbaths: The Inside Story of the Bears-Packers Rivalry." "But if you got a chance to kill a guy, you killed 'im." Mr. Sprinkle, who played in four Pro Bowls, worked during the off-season for Inland Steel as an engineer. He retired from the Bears after the 1955 season but remained a frequent presence in town, appearing at Bears reunions and on the golf course, where he was known as "Sprinks the Left-Handed Golfer," Jecha said. Mr. Sprinkle owned a tile and carpeting store in Chicago's Mt. Greenwood neighborhood and later moved his family and his store to Palos Park. He also owned a bowling alley in Chicago Ridge for a time, his daughter said. In 1962, Mr. Sprinkle returned to football as the head coach of the Chicago Bulls, a semipro team in the United Football League. He took the job after turning down an offer to assist Turner in coaching the New York Titans. Mr. Sprinkle's wife, Marian, died in 2003. Mr. Sprinkle also is survived by two sons, Alan and Steven; five grandchildren; and nine great-grandchildren.